Industry research shows a majority of marketers (55%) plan to allocate more of their budget for influencer marketing in 2019. Lee Odden, CEO and Co-Founder of TopRankMarketing, will discuss influencer marketing trends and how marketers can maximize their marketing dollars during a session at B2BMX 2019. In an exclusive interview with Demand Gen Report, Odden revealed some of the topics he plans to explore, including the rise of macro and micro influencers, the importance of interactive influencer marketing and more. Demand Gen Report: What advice would you give marketers looking to evolve their strategies and successfully change things up this year? Lee Odden: Before marketers make big changes in their marketing approach and tactics, it’s essential to understand why. While most won’t admit it, many B2B marketers still practice some “spaghetti marketing” — each year they throw new digital tactics “against the wall” to see what sticks, without really knowing why a tactic would work for their customers over others. Action: what triggers will motivate the desired action? With buyer discovery, consumption and action metrics, you’ll know how to create awareness, drive great customer engagement and generate compelling offers that matter to your customers, and you’ll always know what approach to use to improve your marketing because it will be customer driven. DGR: Are there any examples that come to mind of B2B orgs looking at their sales and/or marketing through a new lens? Odden: Prophix provides corporate performance management software in an industry not known for exciting marketing. With an understanding that the businesses in B2B are people too, they decided to launch campaigns that would go beyond educating buyers to “infotaining” them. To create a standout content experience for their annual report on the financial planning and accounting industry, they brought together financial industry influencers with an interactive, online game. The quiz-themed game asked questions using data from the report, as well as from the influencers, who were represented as avatars within the game. The creative element to the content, plus the collaboration with trusted industry experts, drove performance of this program above and beyond expectations — beating the benchmark for asset views by 600%. With a taste for what interactive content and working with industry influencers for content and promotion can do, Prophix followed up the interactive quiz/game with another campaign featuring a simulated voice assistant named Penny. An interactive microsite highlighted the intersection of finance and artificial intelligence with Penny as the guide. By interacting with Penny, users were able to access a group of influencers that provided their expertise via audio and text. The microsite had 189% more views than the benchmark and 642% more engagement. By taking what is often called “boring-to-boring content” and repackaging it as an interactive experience with trusted experts who provide useful information, Prophix was able to realize their “new lens” of marketing as something beyond a shiny object. It was effective marketing. DGR: What trends are you currently seeing in the influencer marketing space? Micro and macro influencers. A lot of marketing press has emphasized micro and even “nano” influencers over celebrities. There’s merit to that, but in B2B, the tier-one influencers are still important. Successful programs incorporate top influencers that have large, relevant networks with more niche influencers who have high engagement rates. When mapped to the right kind of content in the buying journey, a mix of influencer types is very powerful for B2B marketing. Centralizing influencer operations. Many B2B companies have experimented with influencer marketing within different regions and business units. Disparate processes and lack of coordination can create real problems along with inefficiencies. Centralizing influencer marketing creates an opportunity to strategically benefit from the role of influencers across multiple departments and in a way that is both efficient and effective. Always-on influencer marketing. At earlier stages of maturity, many B2B brands are campaign focused when working with influencers, and interactions only occur when the brand needs something. More advanced B2B marketers are running always-on influencer programs, where there is a focus on developing alignment, relationships and advocacy. Campaign and event involvement play a role in these relationships but are not the only important outcomes. Focus on quality versus quantity metrics. There’s a big shift happening in the way qualitative metrics are used when running influencer marketing programs. For example, influencer identification now emphasizes topic relevance and alignment with the brand over popularity, and impact metrics have evolved from social share counts to leads generated. Software investment. Less sophisticated influencer marketing doesn’t require more than a spreadsheet, email and a few tools to find influencers. But as B2B organizations start to implement influencer marketing across departments and businesses, coordination of influencer identification, engagement and program measurement requires platform investment. Influencer marketing platforms can provide an easy way for different departments in the same company to find, engage and activate influencers across a variety of programs, as well as manage communication and measure performance. DGR: Your upcoming session is focused all around interactive influencer marketing — can you reveal what “interactive influencer marketing” is and why it’s an important topic for content marketers to think about? Odden: Interactive influencer marketing is engaging with industry influencers to co-create content that is packaged with brand content in an interactive content experience. The sheer volume of information and media that confronts people in the business world is overwhelming and often pretty boring. Creating compelling experiences with interactive content is one way to stand out, differentiate and optimize for effectiveness. At the same time, buyers don’t trust advertising or brand marketing messages. Co-creating content with trusted experts brings credibility and interest to the brand message. My presentation will help B2B marketers understand how to “break free of boring B2B” by exploring the top interactive formats, best practices for influencer engagement and case studies featuring mid-market and large enterprise B2B brands doing interactive influencer marketing right. DGR: What are your tips for effectively partnering with influencers on content? Don’t rely on popularity metrics alone to decide who will be the right influencer, or rely on the opinion of your marketing team alone to decide which influencers to work with. Relevance, resonance and reach metrics should be used for influencer identification and validation. Don’t wait until you need an influencer to reach out. The time to raise an army is not the first day of the war, and the time to recruit influencers is long before you need them. Start the romance early by following, engaging, commenting and reaching out in a way that adds value. When the time comes, the relationship you’ve developed will make it much more likely the influencer will say yes. Do your homework on the influencer. Understand their expertise, voice, content preferences and approach. Also look for signals that reflect engagement opportunities like interest in speaking at events, being an author, getting media exposure or access to brand experts. Do match influencer type and topic of relevance to the appropriate content. Beyond the basics, like ensuring an influencer who creates video is engaged to create video instead of publishing a blog post, match famous influencers (aka “brandividuals”) with top-of-funnel awareness content. Similarly, match niche influencers, like customers or advocates, with end-of-funnel content. 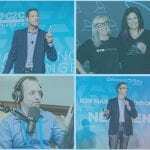 DGR: What else can attendees expect to learn from your presentation at B2BMX 2019? Odden: Besides case studies and best practices for interactive influencer content, I will also share tips on tapping more creative ideas, how this kind of content helps SEO and how to measure influencer marketing success. DGR: What are you hoping to learn more about at B2BMX 2019? Are there any sessions you’re looking forward to? Odden: I think this is my fifth or sixth year speaking at B2BMX and I always look forward to connecting with other marketers to learn about their top challenges, successes and goals for the coming year. I am also really looking forward to the keynotes from my longtime friends David Meerman Scott and Tim Washer. Brian Fanzo has collaborated with us quite a few times as an influencer, but I have not seen him speak so I am looking forward to his keynote as well. There are numerous B2B professionals who will be presenting that I respect and learn from every time they speak, including Ardath Albee, Michael Brenner, Amanda Maksymiw, Jeanniey Mullen, Pam Didner, and Carlos Abler (to name a few) that I am looking forward to seeing.